Mink Meadows Golf Club is a semi-private golf club located in Vineyard Haven and adjacent to West Chop on the island of Martha’s Vineyard, MA. The course is open year round, weather permitting, and features rolling terrain with ocean views over Vineyard Sound to Woods Hole and the Elizabeth Islands. Both Presidents Bill Clinton and Barak Obama have displayed a strong fondness for playing the course during their vacations on the Vineyard. Send more more information about Mink Meadows! The Mink Meadows Golf Club course was designed in 1936 by Wayne Stiles, who employed a style similar to his more famous contemporaries Donald Ross, A.W. Tillinglast and John Van Kleek. 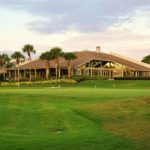 Sheltered by trees and setbacks discreetly off the fairways are 60 homes whose residents form the the Mink Meadows Homeowners Association which is closely allied with the golf club. Owners of property in Mink Meadows become members of the Mink Meadows Homeowners Association (MMHA). Send more more information about Mink Meadows! A major benefit: Private North Shore Association beach. The major benefit of membership in the MMHA is the lovely beach which stretches out along the north shore of the island with long views of Vineyard Sound and the Elizabeth Islands. On any day in summer you’ll see families spread out on the white sandy beach on blankets while children dig for clams or fish from the stone jetty and sailboats parade up and down the Sound. When you purchase of property in Mink Meadows, golf membership may be available and as a Mink Meadows owner, you may receive preferential placement on the waiting list. Send more more information about Mink Meadows! Mink Meadows Golf Club’s location is ideal if you’re looking to be away from summer crowds. It lies adjacent to Tashmoo Woods, a low-density enclave of private homes and condominiums, and is nearby the 90-acre West Chop woods nature preserve. The town of Vineyard Haven with two supermarkets, two movie theaters, two seafood markets, various boutiques, shops, restaurants and much more is just a five-minute drive away. And if you are thinking of using your home in the off-season, Vineyard Haven is the most year-round location of the five towns on the island. Private clubs in the area include the West Chop Club and Vineyard Haven Yacht Club. Membership in both clubs is dependent on sponsorship by members and membership availability. Mink Meadows Golf Club is a nine-hole facility that offers a challenging 18-hole layout. Measuring 3,078 yards on the front nine and 3,139 on the back from the men’s tees, the course is in excellent condition and features rolling terrain with ocean views over Vineyard Sound to Woods Hole and the Elizabeth Islands. The women’s and senior’s tees have recently been reformatted in support of the USGA’s “Play It Forward” program to provide an enjoyable experience for all. The course is open year-round, weather permitting. Send more more information about Mink Meadows! Mink Meadows Golf Club has about 255 regular members, up from 225 five years ago. The club is actively looking for new members as it is currently undergoing a generational transition with elder members leaving the fold, opening the door for the next generation. Regular membership initiation fees, which includes one’s spouse, costs $10,000, and is payable over five years. Senior membership (which has some play restrictions in the summer high season) initiation fees are $5,000 and may also be paid over 5 years. Young Adult membership (Age 40 and under and no play restrictions) initiation fees are $5,000 and may be paid over 10 years. In addition, a two year (2014, 2015) special membership incentive program waives membership dues in the year one joins the club. There is usually a small handful of homes for sale in Mink Meadows at any one time. Homes can range in price from $550,000 to $3 million+ with views of the golf course, woods and Vineyard Sound. See additional details in the real estate section below. Send more more information about Mink Meadows! See the Featured Listing in Mink Meadows Golf Club. For More Information, contact David Lott, Broker/Owner, Vineyard Open House Real Estate at (cell) 203-270-9357, or click the green Request More Info tab at the right. The island of Martha’s Vineyard is seven miles east of Cape Cod and just over 90 miles southeast of Boston, Mass. The island has a total land area of 100 square miles and measure nine miles wide and 23 miles long at its furthest points. The island’s tidal shoreline extends for 124.6 miles. The island has a long history of being a favorite retreat for writers, artists, musicians, politicians, movie stars, journalists and celebrities. Presidents Bill Clinton and Barack Obama, who both share a love of golf and island life, have summered here with their families. Family is a major focus on the Vineyard, where once discovered, becomes a treasured place that is returned to year after year by succeeding generations. Family oriented clubs such as the West Chop Club, Vineyard Haven Yacht Club, Edgartown Yacht Club, Mink Meadows Golf Club, Field Club, Vineyard Golf Club and others feature multiple programs that encourage the generations to interact and enjoy activities and each other. Tennis and sailing are important pursuits for families here who participate in sailing and tennis programs for ages 6 to adult. Both the Vineyard Haven Yacht Club and Edgartown Yacht Club are renowned for the world-class sailors they produce year after year. In Vineyard Haven, the Holmes Hole Sailing Association holds races twice a week throughout the summer and fall where all classes of sailboats and sailors compete using a carefully crafted handicap system. Major races during the year include the Around the Island Race, Vineyard Cup and Moffet Race. Culture and the arts are popular on Martha’s Vineyard. Here playhouses, theaters and outdoor performance venues host plays, music and art exhibitions in which celebrities, summer visitors and islanders perform together and enjoy the scene. Other popular island pursuits are nature walks and preserves, water sports and fishing, fine dining, and of course, relaxing on the island’s world-famous beaches. Tashmoo Woods is located just a mile outside of Vineyard Haven. Also known as Tisbury, Vineyard Haven is the largest of island’s six towns and one of the main points of entry to the island by ferry. Oak Bluffs is the other major town with ferries going to and from the mainland. Main Street Vineyard Haven is lined with quaint shops, while the waterfront features several boatyards and restaurants, including the famous Black Dog Tavern. There is a public dock in Owen Park where transient boaters can rent moorings. Martha’s Vineyard attracts world-class artists, musicians, actors and writers, many of whom call the island home. In Vineyard Haven alone, you’ll find the Vineyard Playhouse, Katherine Cornell Theater and Martha’s Vineyard Hebrew Center, and all are active with performances and activities year round. The newest cultural addition is the theater for the Martha’s Vineyard Film Society. Located at Tisbury Marketplace in Vineyard Haven, the theater is the home of the Martha’s Vineyard International Film Festival each September. Equipped with the latest electronic video and presentation tools, the theater has been the site of live performances, celebrations and special screenings in addition to a regular menu of films each week.